Craftsman C3 3/8-in. Drill/Driver Kit Just $39.29! Down From $80! You are here: Home / Great Deals / Craftsman C3 3/8-in. Drill/Driver Kit Just $39.29! Down From $80! Sears has this Craftsman C3 3/8-in. Drill/Driver Kit only sale for $69.99 but you can get it for just $39.29 after points! Plus you can get FREE shipping on orders over $49 or FREE in-store pickup! Why break the bank? 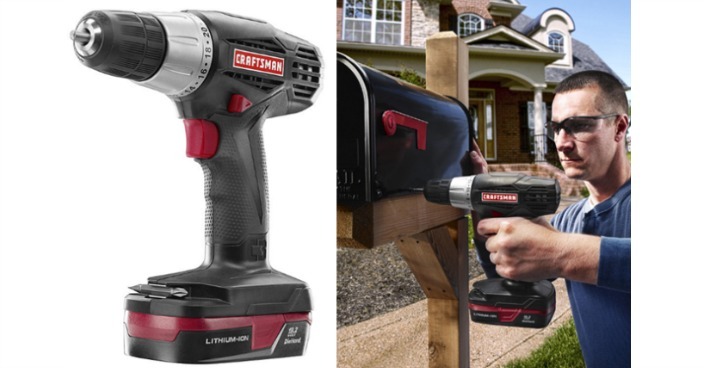 The Craftsman C3 19.2-Volt Lithium-Ion 3/8-in. Drill/Driver Kit has all the bells and whistles at a great low price. With the power and technology of the included lithium-ion battery, experience fade-free tool performance throughout the charge of the battery. Save that arm strength, lithium-ion batteries also weigh less than ni-cd batteries, which means less fatigue and quicker job completion time.